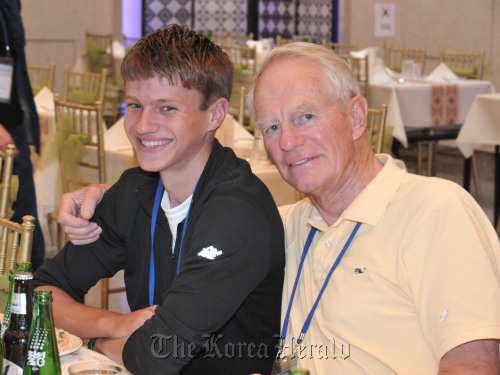 PAJU ― Although it is his first visit to South Korea, Quentin Backstrom, a 16-year-old student from Philadelphia, is quite familiar with the country through the vivid memories of his grandfather, who fought here during the 1950-53 Korean War. The veteran Robert Hoyt brought the oldest son of his second daughter here this week for a six-day trip to offer a glimpse of South Korea’s fast progress since then and continuing military tensions on the peninsula. Among other destinations in his itinerary, the Demilitarized Zone, which he visited on Thursday, was the most impressive. He saw only a thin borderline dividing the two Koreas, which seem to be worlds apart in all aspects. “I was impressed by the soldiers there and their commitment to protecting the border. I learned how tense it is over there. I heard a lot about the war from my grandpa,” Backstrom told The Korea Herald. He and his grandfather were among some 160 veterans and relatives from the U.S. and Turkey who came here this week under the “Revisit Korea” program, which is run by the Ministry of Patriots and Veterans Affairs with support from the Korean Veterans Association. Their visit will end on Monday. The program, incepted in 1975, is designed to maintain good relations with 21 U.N. allies that supported the South with combat troops, medical and material support during the war. Unfortunately, the tour of the DMZ ― the four-kilometer-wide buffer zone, the center of which the Military Demarcation Line runs through ― was hampered by torrential rain that continued throughout the whole day. Many veterans and their relatives apparently were disappointed that they could not clearly see the DMZ, which has become a significant symbolic site embodying peace and security and a thriving habitat for endangered and rare plants and animal species. Looking out of the bus window, Robert Hoyt said the buffer zone harkened back to his one-year service here in 1953. “When I was there, there weren’t any. All I remember is rice paddies and little huts. No electricity. No running water. They just walked. No buses,” Hoyt, who served as a field maintenance officer here in 1953, said in a strong, clear voice that belied his age of 81. The thick fog that caused poor visibility around the heavily fortified border seemed to reflect the long-standing stalemate between North and South, which has even worsened in recent years. Tensions between the two Koreas have remained high since the two deadly attacks last year that killed 50 South Koreans, including two civilians. The North has yet to make an apology, which the South has called for as an initial step to enhance bilateral ties. The Korean War, the first major armed conflict of the Cold War era, broke out on June 25, 1950, after the North invaded the South across the 38th parallel with backing from China and the former Soviet Union. What impressed Korean War veterans most during their tour here is the economic development South Korea has achieved from the “appalling devastation of the tragic war and abject poverty” in a relatively short time, they said. “(During the wartime), the thing that tore me up is as we travelled by train, the children that would come to the train with brothers and sisters on their backs, begged for food. We gave them candy and things like that. It really bothered me ― the poor conditions folks were in,” Charles A. Pearson, 81, said. Charles arrived here in June, 1952, and worked as part of a wire communications team under a field artillery unit before leaving Korea in August 1953. His emotional attachment to this country originated not only from his military service here, but also from his daughter’s decision some 25 years ago to adopt a Korean child. “She was an orphan. One day, (I want to tell her) your (biological) mother has done so much for you … your parents and grandparents … because they put you up for adoption. That must have been tough for your mother,” Pearson said. For some veterans, the tragic memory of having to lose their fellow soldiers on the battlefields still keeps surfacing in their minds. “I still remember it was September of 1952. We lost one fellow soldier. It was a very sad time. I lost quite a few friends over here ― fellows that I hung around from school days all the way to (that time),” Norman Schultz, 79, said. Schultz came here as an Army corporal in July 1952 and belonged to the 2nd Infantry Division. The U.S., the biggest foreign contributor to the war, dispatched 1,789,000 soldiers and 36,940 of them were killed in action, according to government data. The data shows 40,667 U.N. soldiers were killed in action with 104,208 wounded in action. A total of 4,116 soldiers were missing and 5,815 became prisoners of war. What made the tour of the DMZ more unique were the 23 Korean university students who joined the veterans to learn about the Korean War through their first-hand accounts of the wartime experience. “I could see the military tensions here first hand. I could actually feel that the two Koreas are in a state of cease-fire. A grandfather (a U.S. veteran) showed me color photos and explained them in detail,” said Seo Hee-jeong, a 23-year-old student at Hanyang University. On Friday, President Lee Myung-bak saluted hundreds of Korean War veterans from home and abroad for helping to save South Korea from the North’s invasion. “I deeply bow my head and experss my respect to you who devoted your hearts and bodies to the country by putting studying behind and picking up guns despite your young age,” Lee said during a reception held in commemoration of the outbreak of the war.